JLA/Doom Patrol #1 review: Milk Wars starts here! – AiPT! 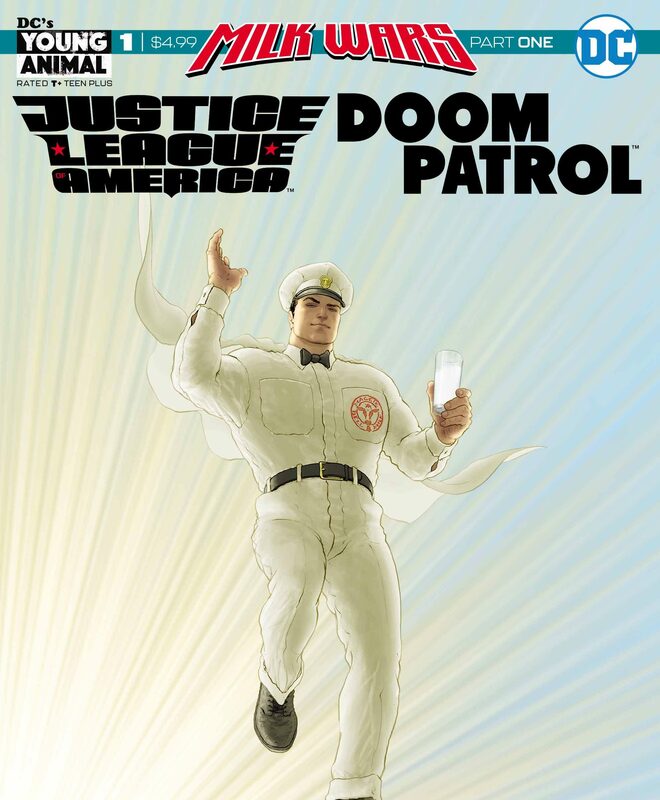 JLA/Doom Patrol #1 review: Milk Wars starts here! Welcome to the UnEvent of the year as the weird and wonderful Young Animal finally meets the regular DC universe in a completely crazy crossover for the ages! JLA/Doom Patrol #1 is the first part of the Milk Wars event, where members of the Young Animal line meet with members of the main DC universe ranging from the Trinity to Swamp Thing. This first issue is a solid start to the event and really sets up how crazy this event will be. However it falls slightly in the fact that the final Doom Patrol issue has yet to released, which leaves some questions about what was meant to be in between. The art by ACO is great and fits the bizarre meld that is this crossover. The issue opens up by setting the premise that Retconn is moving from broadcast to real estate by showing a model home to Lord Manga Khan, their new client. The issue then shows the main villain(?) Milkman Man delivering milk to a household in Happy Harbor, Rhode Island, which ends with their deaths. The Doom Patrol then come flying out of a portal from somewhere in Danny the Ambulance and landing in the middle of the street. The banter throughout the issue is fantastic and I would expect no less from Gerard Way and Steve Orlando. The book also sets up the rest of the crossover including the Cave Carson issue — it was previously unknown how it’d tie into the event. The short backup at the end of the book is a small Silver Age-type story about a superhero that’ll end up becoming Eternity Girl with some nice Silver Age homage art. The issue has beautiful art by ACO which includes a four page spread of the Doom Patrol against the Community League of Rhode Island and it is absolutely stunning to look at. There aren’t many other books that have a four page spread that looks this great — think Jim Lee’s Batcave spread in All Star Batman and Robin the Boy Wonder. There is also a two page spread showing the JLA in their Community League forms alongside the covers of their first issue debuts which again looks absolutely amazing. This is one pretty book. A fantastic first issue filled with weird and wonderful content. Brilliant writing and fantastic art make this a must read! Perfect way to start an event that meshes the crazy imprint with the main DCU. Fantastic writing by Gerard Way and Steve Orlando as usual. ACO's art never disappoints and JLA/Doom Patrol continues that trend. Some slight confusing parts of continuity due to Doom Patrol #11 still not being released holds it back from being perfect.